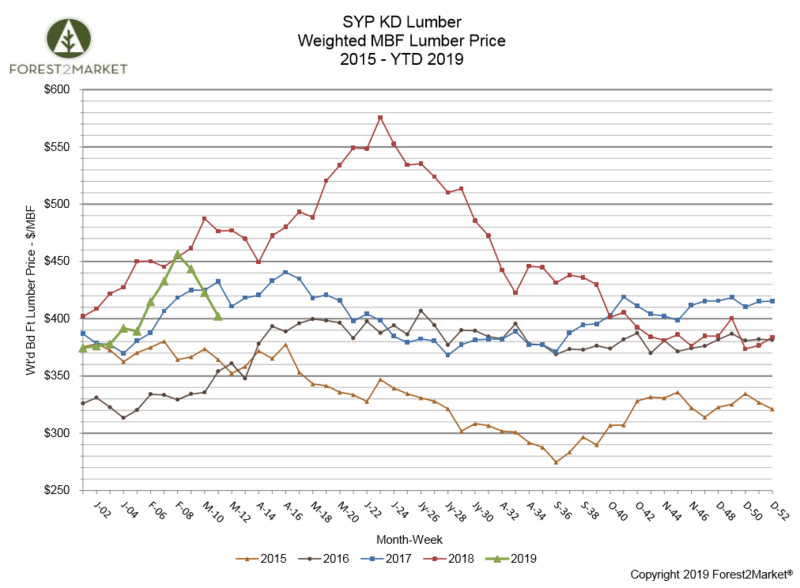 Southern yellow pine (SYP) lumber prices skyrocketed in February, prompting us to ask the obvious question at the time: Will history repeat itself, and will prices reach record highs for a second year in a row? How quickly markets change. Just a month later, the trend reversed course sharply and SYP lumber prices dipped to their lowest levels since the end of January. Forest2Market’s composite southern yellow pine lumber price for the week ending March 15 (week 11) was $402/MBF, a 4.9% decrease from the previous week’s price of $423/MBF and a 16% decrease from the same week in 2018. However, prices rebounded considerably a week later. Forest2Market’s composite southern yellow pine lumber price for the week ending March 22 (week 12) was $419/MBF, a 4.2% increase from the previous week. The YTD average price from Forest2Market’s SYP composite is $408/MBF, compared to $447/MBF during the same period in 2018. 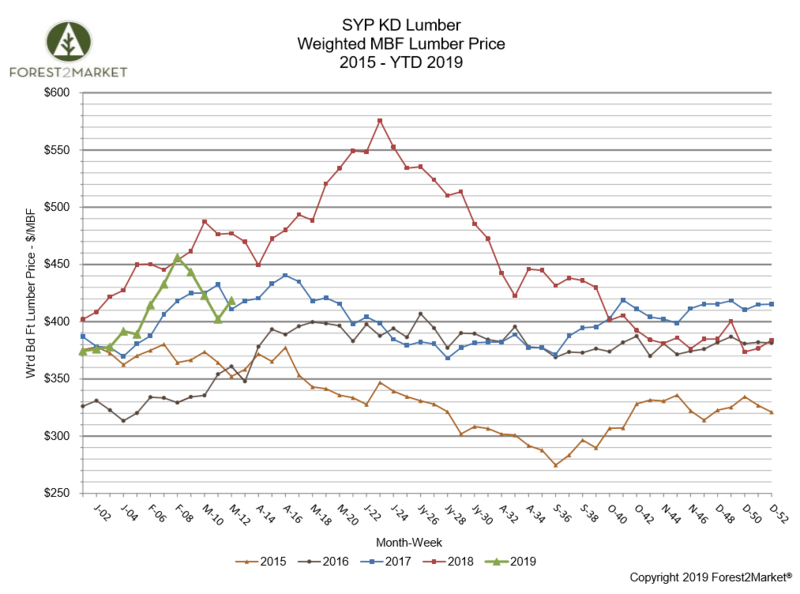 While SYP lumber prices are off 8% from their 2019 high in February ($456/MBF), the volatility is not unique to southern lumber. 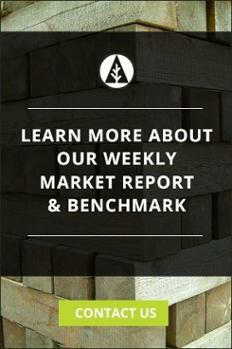 As Courtney Sherwood wrote recently in a Daily News piece that referenced commentary from Forest2Market’s own Daniel Stuber, “After peaking at $582 per 1,000 board feet last May, the price of Douglas fir is down to $390 this month, according to Nasdaq commodities data, and experts are unsure of what to expect next.” Fresh data from Madison’s Lumber Reporter shows a similar month-over-month trend with some of the high-volume products in the Pacific Northwest: WSPF 2x4 #2&Btr KD lumber was down 5%, and ESPF 2x4 #2&Btr KD lumber was down 4.4%. However, these worries haven’t materialized into the market panic they did last year. As we head into the early part of the building season, it’s still too early to get a true reading on the transportation dynamic vs. US demand. Stay tuned.